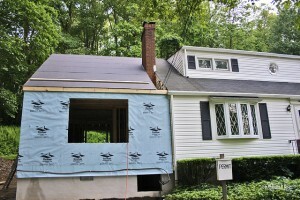 Your Home Addition: Protect Your Existing Home While Building - Armchair Builder :: Blog :: Build, renovate, & repair your own home. Save money as an owner builder.- Armchair Builder :: Blog :: Build, renovate, & repair your own home. Save money as an owner builder. You’ve decided to put an addition onto your home as an owner-builder in order to add valuable space. Once your new addition is complete, your family room and kitchen will open up into the large, new space that your family will enjoy for years to come. Your new construction project will go on for several months so how do you protect your existing home from the rain, snow, and cold while building? How do you keep the dust and noise out that comes along with the construction of your new home addition? Leave Existing Structure Intact: By leaving the existing structure of your home intact for as long as possible, you prevent water and dust intrusion into your home. Your carpenter should be able to strategically cut siding where necessary to tie the new walls into the existing walls. Take a look at the picture of the new home addition above. They have kept the siding and roof in place while building the new structure. It’s also a good idea to leave windows and doors in the old structure…even if they will be eventually removed. This helps keep out all kinds of bad byproducts associated with construction including water, cold air, dust, noise…etc. Any walls that you must open up, you can protect with a good quality housewrap or visqueen. If your roof planes will line up (with no overlay), you should be able to build your new roof deck right under the old shingle overhang. Then your roofer can remove old shingles as necessary to tie the new section into the old. If your new addition requires building a gable on top of your existing roof, you will want to coordinate carefully this work with the weather, roofer, and carpenter. Tarps help keep water out but they aren’t bullet proof. Choose Your Start Date Wisely: I’m a big believer in managing what I have control over. So, if I’m planning on doing any major construction work on my home, I wait until the good weather months. If I can choose when to start my project, why would I choose the cold or wet months? If I do, I’m making my life more difficult than it needs to be. Of course anything can be done. Building in cold weather is done all the time. However, it will take more time and cost more money. Building in the winter requires admixtures, hot water, and blankets for concrete, temporary heat for drywall, tarps and heat for exterior masonry…etc. And there are some things you won’t want to do outside in the freezing winter months including pouring exterior flatwork, painting, and landscaping. Being in complete control is one of the best reasons to act as the general contractor for your owner-built project. For more reasons to take on this role, check out our video Why Build My Own Home? Use Plastic Between Old and New: Once your rough carpenter does get to the point where he needs to cut into your existing home, make sure you seal up with plastic sheeting between the old and the new. This will help keep some of the dust out of your existing home. Put on Your Headphones: Unfortunately, there’s not much we can do about the noise. If you have followed my advice above and left the existing structure intact as long as possible, you should minimize the noise in your existing home. However, the noise can’t be eliminated completely and it will get louder when the walls between the new and old come down. The good news is…it’s only noisy during the day when work is being done. To see our complete preplanning checklist for your new addition, check out this previous post titled Tips for Adding on to Your Home.